I was so excited when Lori @ Creating Beauty in the Kitchen asked me to do a guest post for her. It is just such an honour when one of your blogging buddies has enough confidence in you to ask you to fill in a post when she is in a pinch. Of course who could say no to Lori? All of us who know her, just love her sweet, friendly nature and would be more than happy to help her out. When Lori reminded me that the recipe I chose should be low-glycemic, I rubbed my hands with glee! Truth be known, I eat this way most of the time too, but I don’t adhere to a strict diet. My body just feels better when I feed it food from natural sources, low in sugar. For me this means loads of vegetables, protein from plant and animal sources and of course fruits, especially berries. 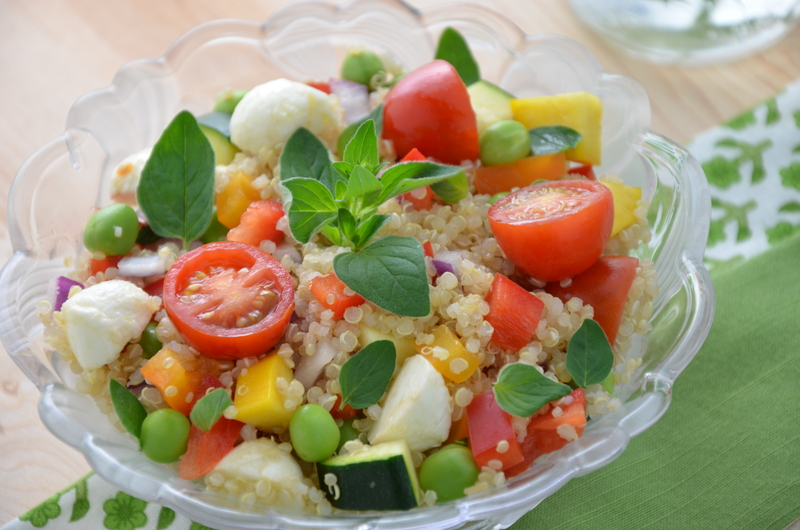 Today’s recipe reflects that way of eating, and I was pretty sure that Lori would like it because she had admired one of my other quinoa salad recipes. 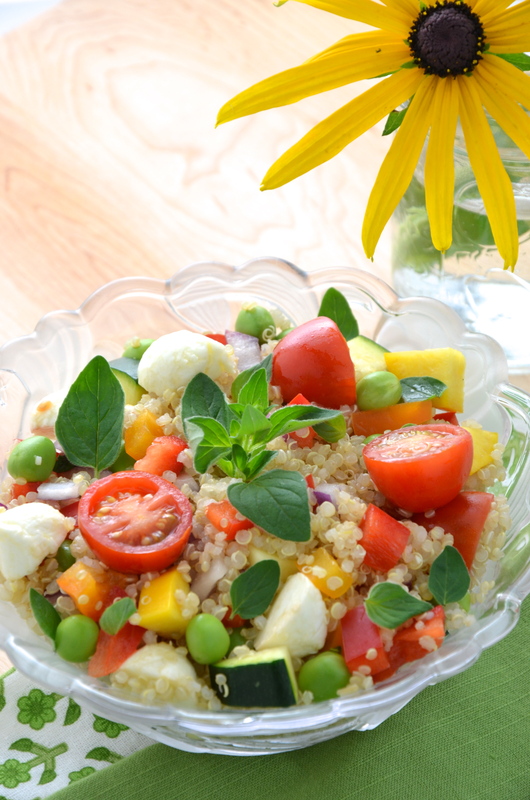 This recipe is perfect for summer time because vegetables are very fresh this time of year. I used fresh peas and oregano, which really make the salad taste like summer. This recipe is modified from “Quinoa 365”, by Patricia Green and Carolyn Hemming. I hope that you enjoy it, Lori and thanks for the honour of asking me to guest post for you. Bring quinoa, water and salt to a boil in a medium saucepan. Reduce heat to a simmer. Cover and cook for 10 minutes. Turn the heat off and leave saucepan, covered, on the burner for another 5 minutes. Remove the lid and fluff with a fork. Set aside until completely cooled. Combine the zucchini, tomatoes, onion, peas and peppers in a large bowl. Whisk the vinegar, olive oil, mustard, oregano, garlic, salt and pepper together in a small bowl. Pour the dressing over the vegetables and mix all of the ingredients. 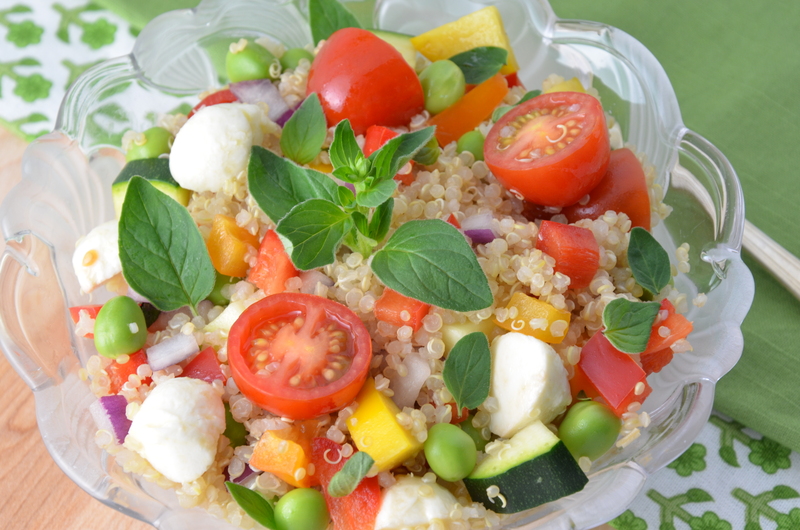 Add the quinoa and bocconcini and mix until evenly combined. Looks delicious, Julianna! Just saw the post at Lori’s and think it’s just lovely! Thanks Ngan! I love cooking with fresh veggies in the summer. It is such a treat! Gorgeous salad, Julianna! I bet the oregano in the dressing makes it taste amazing, not to mention all of the other yummy ingredients. Mmm, yes fresh herbs of any kind really make my palette just so happy! Wonderful Salad Julianna , another Fiesta Salad 😀 Lori is lucky girl! Soooo sweet Julianna! Thank you for your kind words! Always an encouragement! I just love this salad!!!! Thank you again for blessing me…so grateful for you! Looks deliciously fresh and flavourful Julianna! Sounds so good! Off to Lori to check it out! Hope you like it, Sonal! Thanks so much, Fae! I thought the colours were really pretty too! Wow, wht a beautifull and healthy salad!! !